Within the last year or so people have suddenly started to want to get into the private rental sector. Why now? Conall McGuire partner Leach & Partners: The private rental sector in Poland has existed for 15–20 years now, but institutional investors were really nowhere to be seen until relatively recently. 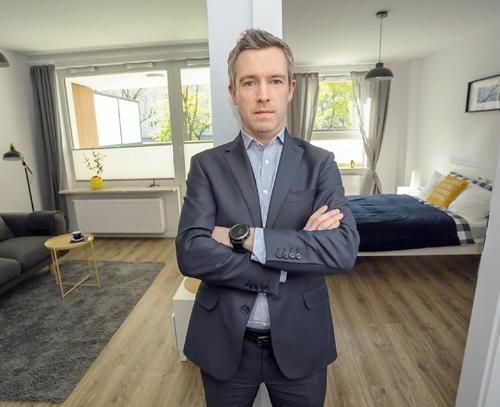 The private rental sector in the US and Western Europe is a massive part of the overall residential market and has been for many years, so you could say it was only a matter of time before we started to witness it on the Polish market. Up until now foreign capital looking at Polish real estate has been focused largely on commercial properties, but as the CEE commercial property market has become more competitive and residential yields in the US and Western Europe have compressed, a mixture of investors already active in the PRS chasing diminishing returns in the US and Western Europe as well as commercial investors already present in the CEE region looking for new opportunities have started to consider the PRS in the CEE region – first and foremost in Poland. Bouwfonds and Catella have really been the pioneers in Poland, with Catella investing in app. 70 apartments in the Złota 44 building, whilst Bouwfonds recently completed a whole building of almost 200 units at ul. Pereca 11 – also in Warsaw. We can see there is plenty of interest from many other investors ready to dip their toes in the PRS waters, with the investment coming mainly from the US, UK, Germany, Scandinavia and the Netherlands. Some have already signed binding contracts with developers and are now waiting for those buildings to be built out, whilst other investors are developing the projects themselves – Golub GetHouse will most likely offer several hundred apartments in a PRS-style scheme on ul. Grzybowska in their Liberty Tower project, whilst White Star will have about 100 apartments dedicated to PRS in their mixed use Elektrownia project in the Powiśle district. How did the Pereca 11 project and your involvement in it come about? Bouwfonds spoke to many developers in Warsaw to try to find a suitable project in the right location and of a suitable scale. They were able to agree and sign a deal up-front with Matexi, and now that the building has been delivered ownership has been transferred from Matexi to Bouwfonds. The latent interest from institutional investors hadn’t escaped our notice and so we formed Leach & Partners early in 2017 to offer a holistic administration, letting and property management platform specifically for these new investors in PRS and student housing drawing on our 15 years of experience operating on the Polish market under the Warsaw Properties and Leach & Lang brands. Bouwfonds was our first institutional client and its pipeline suited us down to the ground, playing to our strengths with our own established base here in Warsaw and Tom Leach’s strong presence in Kraków. Kraków will be the location of Bouwfonds second PRS –and student housing – project in Poland, coming online in May 2019. Tell me more about the buildings. Pereca 11 is aimed squarely at young professionals. Whilst it is said that Poles traditionally enjoy owning their own apartments, we have been seeing a growing trend amongst twenty-somethings who are not yet ready to commit to buying and prefer the flexibility of renting. Whether this is based on the experience of watching their parents struggle with Swiss franc mortgages or simply due to the ‘carpe diem’ attitude of these millennials, this younger generation is happy to have their bike, the metro, a rented apartment and no other overheads. On ul. Pereca there are 193 apartments, six retail units and 85 parking places as well as 200 spaces for bikes. We already have a convenience store signed up for a corner unit on the ground floor and many other negotiations – some already at an advanced stage – with various service providers for the remaining units. As far as the residential part of the scheme goes, we have already signed up our first few tenants and based on current interest are hoping to let out around 30 more units by the end of April. We offer both furnished and unfurnished options and thus far have furnished 40 of the apartments with a tailored furniture package and have also created a special ‘all-inclusive’ price offer for corporate clients who want to avoid the hassle of signing electricity contract or cable TV contracts themselves. The apartments at ul. Pereca 11 start from 40 sqm and rents start from PLN 2,600 per month. The Kraków project on ul. Rakowicka comprises app. 250 apartments, around 100 of which will be aimed at students whilst the rest are designed to suit young professionals. Delivery is scheduled for Q2 2019. . There are a lot of people watching these projects, so of course we are working hard for them to be a success – we believe there is huge potential for the PRS market in Poland. The Polish REIT act is now being redrafted as a residential property investment act. Once these REITs or these FINNs (Fundusze Inwestycji w Najem Nieruchomości) come along they will also help standardise people’s perceptions of what PRS is. I guess a key question is how keen developers will be to cooperate with them. In the current bullish residential market where land is difficult to buy in good locations at reasonable prices, developers are loathe to sell off several hundred units at a time with a discount when they can sell on the normal market at their full price within a reasonable timescale. Of course, the market is cyclical so it may be in a few years that developers – particularly those in multi-phase projects – will be keener to co-operate.